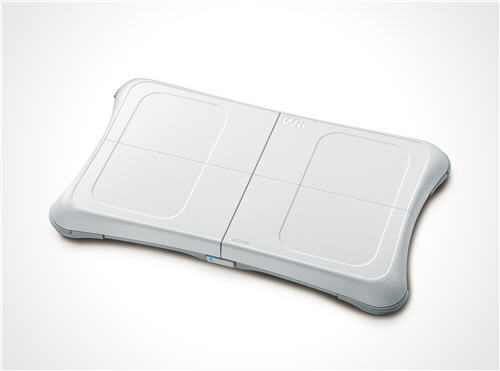 The Wii Balance Board caused major excitement when the Wii Fit was released in 2008. The Balance Board and the Wii Fit game have been so popular that they're almost impossible to find in shops. The Balance Board looks almost like a fancy bathroom scale. The technology in the Board can measure your body weight as well as track your body movements during games. The Board measures body weight up to 330 lbs (150kg), but can actually hold up to 660 lbs (300kg) before it will physically break. Inside, the Board has highly sensitive feedback sensors that measure the amount of pressure you put on each part of the Balance Board when standing on it. As you move, the sensors detect the changing pressure points on the Board, sending this information back to the Wii console. This is how the Wii knows the movements you’re making as you play the game! At the moment the Balance Board is only available together with the Wii Fit game, and you can't buy the Balance Board on its own. There also hasn't been any date set when the Balance Board will be available separately. The Wii Fit and Balance Board is more expensive than other Wii games, because the technology in the Balance Board is expensive to make. The Wii Fit costs around $90 in the US and £70 in the UK. If you're worried about spending a lot of money on the Wii Fit and Balance Board, you'll be able to use the Balance Board in more and more games in the future. There's a lot of interest from game companies in using the Wii Balance Board as a controller in other games besides Wii Fit. Even though lots of games are still being developed to use the Balance Board, there are already a few games available in stores. These games are shown at the bottom of this page. If you're undecided about buying the Balance Board and Wii Fit game, why not read my Wii Fit review to see what all the fuss is about. The Wii Balance Board is an amazing accessory that takes video games in a whole new direction. The Wii mote controller already makes you feel part of the Wii games, but together with the new Balance Board makes video games more interactive than ever before. We Ski – is a skiing game with over 150 ski challenges to complete. The Balance Board is used to turn left and right by moving your body weight on the board. We Ski & Snowboard – is the sequel to We Ski and uses the Balance Board even more than the original We Ski game. Shaun White Snowboarding: Road Trip – is a snowboarding game without the freezing cold. The game makes full use of the Balance Board to perform tricks and complete challenges. Skate It- is a skateboarding game where jumping around on the Wii Balance Board makes you do tricks in the game. Winter Sports 2 – uses the Balance Board to play in 9 different winter sports. Like some of the other games, one of the main features is snowboarding, which uses the Balance Board to control your movements. Jillian Michaels' Fitness Ultimatum 2009 – is a new fitness game looking to pick up where the Wii Fit leaves off. I'm sure there are going to be lots of celebrity fitness games coming out that use the Wii Fit Balance Board. I wouldn't be surprised if all the celebrity fitness programs move from DVD to the Wii console. All Star Cheer Squad – is a cheerleader game for the kids. The Balance Board is used to perform cheers and dance moves in competitions as you try to make it to captain of the cheerleading squad.